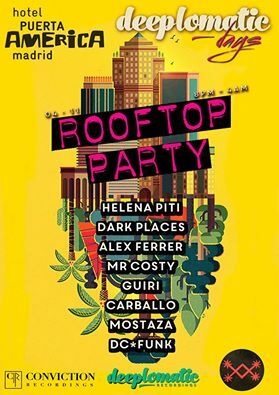 Este Viernes 4 de Noviembre, estamos de vuelta con nuestro Rooftop Party en el Hotel Silken Puerta América Madrid, el ático mas alto de toda Madrid con una vista panoramica increíble! Una fiesta única desde las 8h de la tarde y hasta las 4am con un inmejorable line up, buen ambiente y mucha diversión! IMPORTANTE – Para estar en LISTA y poder entrar gratuitamente: hay que dar a ASISTIRÉ al evento y haber dado like a la pagina de Deeplomatic Recordings. Si vienes con acompañantes escríbelo en el muro! Entrada Gratis en lista – Free Entry with guest list. Friday 4th of November! Deeplomatic is back with an awesome Rooftop Party in Hotel Silken Puerta de America, the tallest rooftop in Madrid, with some incredible views from the capital! Come and enjoy one of the best sunsets in Madrid, with a great crowd and even better music! IMPORTANT – To be in the guest LIST and get in for free: click attend to the event and like the Deeplomatic Recordings. If you come with guests add them on the wall too!